Concerto for Viola and Orchestra A major (after the Clarinet Concerto K. 622). Composed by Wolfgang Amadeus Mozart (1756-1791). Edited by Christopher Hogwood. For solo viola/piano. This edition: 3rd printing 2011 edition. Stapled. For performances with orchestra please use score and parts of the original version BA 4773. Level 3. Piano reduction, Part(s). Composed 1802. KV 622. 46/15 pages. Duration 21 minutes, 30 seconds. 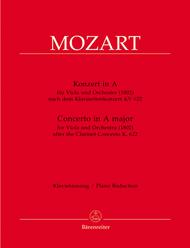 Published by Baerenreiter Verlag (BA.BA5336-90).ISBN 9790006504503. 31 x 24.3 cm inches.